For the 2013-06-22 concert, Bobby Ho has composed for and trained TCO drum ensemble in a piece titled Legend of Jade Dragon 傳說的玉龍. Bobby’s musical history is rooted in piano lessons with Alice Ho, where his lack of rhythm and coordination at the time drove him to take drum lessons. He unexpectedly found his passion for drumming when he began forming his own bands and participating in extra-curricular music ensembles. Since then, he decided to supplement his musical horizon by composing and arranging music for percussion ensembles, orchestras, choirs, symphonic bands, and his personal rock bands. Bobby’s interest in drumming has expanded into the realm of traditional Chinese percussion instruments, including the lion dance drum, flower pot drum (hua pen gu), and drum set (paigu). 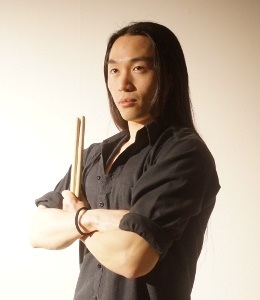 One goal he would like to accomplish in Chinese percussion music is to contribute new techniques and rhythmic concepts to the art while maintaining its cultural distinctiveness. Despite his passion for music, Bobby earned his B.Sc in Psychology and minored in Music History and Culture at the University of Toronto. He is specifically interested in mental health of psychology, hoping to promote mental health and development through music. As a former music coordinator for an inpatient group at the Centre for Addiction and Mental Health, Bobby provided musical leisure to individuals diagnosed with various mental health conditions. He currently works as a drum instructor at the Canada Music Academy and recently began offering lessons to individuals with developmental, psychological, and/or physical disabilities. Outside of his professional life, Bobby teaches lion dance drumming at Apex Martial Arts Academy and composes music for the Toronto Chinese Orchestra’s percussion ensemble. Bobby studied music history and culture with Caryl Clark, James Kippen, Jeff Packman, and Joshua Pilzer. In 2010, he was the runner up in Sabian’s Most Warped Drummer Contest.